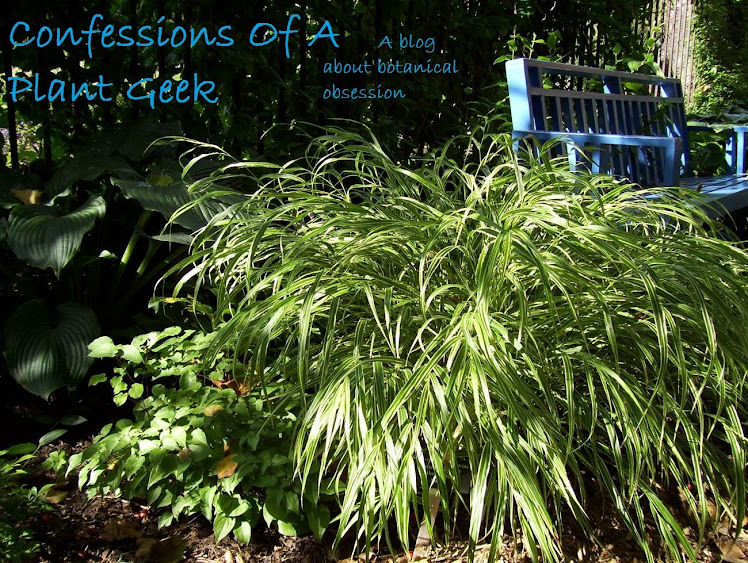 Confessions Of A Plant Geek: "Your gardens must be beautiful!" This is the comment I get most often while talking to customers at work. They don't believe me when I tell them that they actually look pretty terrible. Working in horticulture, I don't have time to weed in spring or early summer. I also have a dog that is keeping me from planting or spraying in one area. So, here is photographic proof that my gardens are nasty looking. First is the driveway garden. A crazy mess at the moment, but I'm slowly getting it under control. My dog tramples anything near the house in this garden, and everything used as foundation planting along the house. Quackgrass is taking this garden over quickly... wish I could spray it since pulling it just makes it angry. Here is the foundation planting where this is no longer a dog to trample everything. This is newly planted, and will hopefully start to look better if I can keep it weeded. Around the corner from the previous picture. Just need time to clean it up and it will be ok.
And now for the shot that redeems all this ugliness. My butterfly garden is pretty good. In the process of some editing, and still needs lots of weeding but I enjoy it and the critters it brings. No Monarch caterpillars this year though, despite having 3 species of Asclepias for them to munch on. This garden is also nice, although not very colorful. Unfortunately we haven't had the time the last 2 years to grow the huge variety of food we had been. Despite the fact that this garden didn't get planted until the last week of June and the Tomatoes and Peppers are bearing late, it looks awesome and everything is healthy. All those neat conifers you sell and no representation in your garden! The flower are great but the green leaves can only give you so much architectual, color and texture interest.